In many ways, your effectiveness to reach and disciple students is linked to your ability to recruit and train volunteer leaders. I am frequently asked by student pastors if there are some specific things to look for when recruiting a volunteer to know if they are a good fit. Along with that very important question I am asked about what specific things leaders need to be trained on in order to make them more effective. Those conversations were the genesis of this 4 part series on the blog. Last week we looked at the first element of a successful volunteer: shared vision. 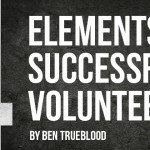 Today let’s dive into the second element of a volunteer leader: a heart for students. Now, this may sound overly simplistic but it is incredibly important. A question to ask leaders during the recruiting process is simply: what do you think of this generation of teenagers? With this question you are looking for a general belief by the potential leader that they think God can and wants to do big things with teenagers. You want leaders who believe that this generation needs to be challenged, to have a “raise the bar” moment that they strive to reach in God’s strength. You want leaders who believe that this generation can change the culture in which they live. You don’t want leaders serving in your ministry who believe that teenagers just need to be corralled or kept busy until they graduate. You don’t want leaders whose desire to serve is based out of a desire to “just keep these kids from getting into trouble.” While that is a noble sounding goal, it doesn’t have anything to do with real discipleship or a desire to see a student’s life radically transformed by Jesus. Are they parents, and if so, is their only goal in being there a desire to keep an eye on their own kids? While this shouldn’t disqualify them immediately it is something that you should address directly. There are more students in your ministry than just their children, and your student ministry should never be the launching pad for more helicopter parenting. Is the potential leader wanting to serve because you or someone else made an announcement that more student volunteers are needed? There are great people in churches who just desire to serve where they are needed. One week it may be in the parking lot and the next it may be in student ministry. These “utility players” are awesome for churches, and there aren’t enough of them. However, for a leader who you will be putting in place as an ongoing leader in your ministry tasked with building relationships and discipling students, this is a bad fit. Why? Because they will be on to the next area when the next announcement is made. This group of people is perfect for your disciple now, mission trip, insert your own big event here. 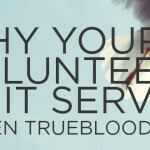 Keep their information in your phone because they can be the jack-of-all-trades volunteer for you. When a leader has a heart for students it will be clear to you both in their words and in their actions. They will keep after you until you follow up with meeting them. They will pursue serving in the student ministry and they will be able to articulate why they care about teenagers and want to see them come to know the Lord. For many, this is something that God has placed in their heart and all you need to do is fan the flame. Take your time. Don’t install them as leaders right away. Instead, give them a clear path to involvement that starts with low responsibility so that you can observe them. With these steps, make sure they are able to see some of the things that God is doing in the ministry. Expose them in small doses to God’s work and allow Him to begin to shape their heart towards student ministry. Carve out time for them to hear from the students themselves about what God is teaching them or how He is using them. I’ve found that when potential leaders hear testimonies from the students they begin to see past the surface of their own perceptions of student ministry to the real life changing ministry that is taking place. This helps them develop the view that God really does want to do incredible things with this generation. Be honest about the challenges of serving with teenagers. Talk bluntly about the issues that they deal with and some of the conversations that you’ve had, without betraying confidence in confidential matters. As God shapes the heart of a leader for student ministry these challenges won’t scare them away. It might make them nervous, or feel inadequate to handle some of the issues but it will also cause them to press in further to find out how they can be part of the discipleship process in the midst of the struggles. Share your own story of calling and commitment to student ministry. Talk about what God has done in you, what you want to see happen in your students, and how you believe God is leading you to get there. It is important that your leaders have a heart for students. This is a lot more than being willing to tolerate students for an hour or so a week. As you recruit potential leaders, look for signs that God is calling them to serve with students; that it is something in which they are willing to invest their time and energy. It’s better to have an empty chair than to have someone who doesn’t truly care about students. Remember, you are going to be in the trenches with these people. You want people who are willing to fight alongside you to disciple students and their families.